A most genial host with great attention to little things. Lovely stay, thank you. A very pleasant stay. Great breakfast. Loved the chat about the golf! Many thanks for looking after us so well. Lovely breakfast too! Thank you for your hospitality - lovely host! 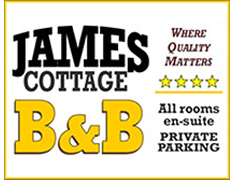 Excellent, friendly and a comfortable stay in James Cottage. Thanks and we'll see you again. We had a fantastic stay and we will be back again. Thank you with a smiley face. Fantastic B&B. Excellent room, food and atmosphere. Brilliant host. Thank you Michael. Had a great stay, thank you. Wonderful B&B. Great sleep in a lovely room. Great breakfast and a fantastic host!